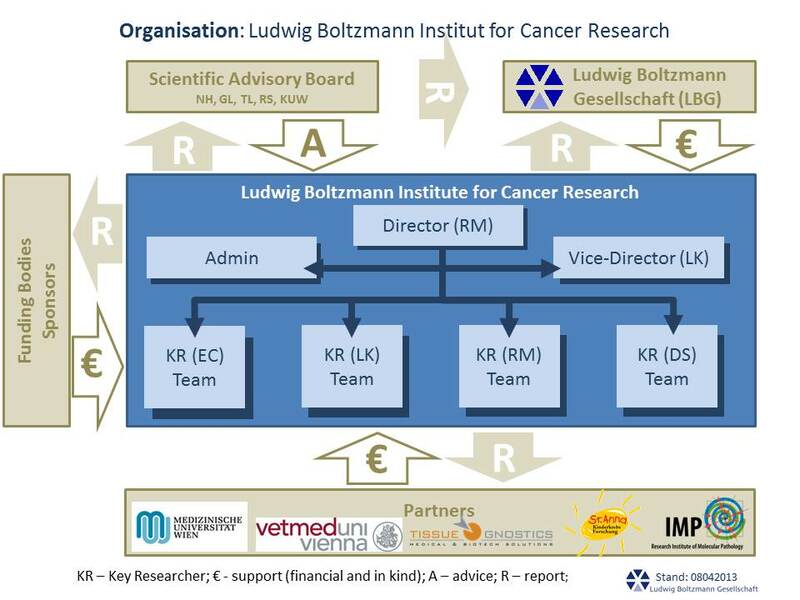 The Ludwig Boltzmann Institute for Cancer Research is located in the Institute of Pharmacology, where most of the research activities are carried out. The institute is headed by Richard Moriggl, who is supported by three key researchers, namely Emilio Casanova, Lukas Kenner and Dagmar Stoiber. The LBI-CR conducts an internationally competitive research programme focused on the analysis of core cancer pathways and utilises modern tools of mouse genetics to elucidate functional cooperativity in cancer development and progression. The LBI-CR performs its research under guidance of an international Scientific Advisory Board and in close co-operation with four research institutions and a biotech Partner. The Scientific Advisory Board and the Ludwig Boltzmann Gesellschaft regularly evaluate the scientific performance and have ranked the institute's performance highly in the past. This was based on its scientific output, support for junior researchers and its ambitious research programme. Currently the institute is integrated into the Partner universities MUW and VetMedUni, which is supported by three endowed professorships which were granted to Emilio Casanova, Lukas Kenner and Richard Moriggl in 2014. With an interuniversity platform for "Comaprative Pathology", which became functional in 2015, the expertise of the institute is sustainably integrated into the universities ensuring the Austrian research environment benefits maximally from the institute's expertise and strengthening cancer research in Vienna. Based on several outstanding evaluation reports by internationally renowned scientists the LBG and partners committed funds for an operation of the institute until the end of 2018.